I need fencing poles around my yard or I am looking for an average fencing pole, what poles do I need ? Generally Fencing poles are 2.4m high with a 75/100 mm in thickness. The poles would need to ideally sit 600 mm into the ground, thus your fence height will be 1.8m high. We also stock 1.8m high weldmesh as well as all the straining wire and U nails that you would require. Yes most definitely all our poles are CCA treated and come with an SABS stamp of approval. What is the difference between a Post and Rail fencing and Normal treated poles ? The timber used for post and rail is Pine. 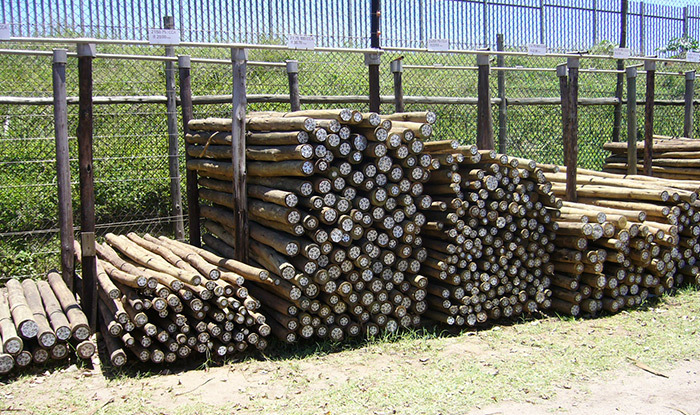 The timber used for treated poles is of the Saligna variety. Post and rail fencing relates to fencing which is machine cut to size and has a smoother appearance as opposed to Saligna Poles. Post and rail come with pre drilled holes in the post for where the rail slots in to the post. Tell us about your Picket fencing? Certainly, The picket fencing is comes in 4 different heights - 600 /900 / 1.2/ 1.5/ 1.8. The gap between each slat is 76mm. They are made using treated pine slats and are all a standard 1.8m in length. The come in their natural wood colour and can be coated with Waxsol or any outdoor paint and preservative of any colour. We can supply them or install them as well. Do you make a solid picket fence? We do not stock this but we can make it to order as long as you fill us in on the quantities that you would require. Yes Durban Poles has an installer with over 15 years of experience in installations. He would be more than happy to come out to your place to give you a quotation. I would like to build a carport or secure an area of my garden from monkeys. Do you have anything that I can use ? Yes we do. We stock a dark green colour of shadecloth which is sold by the meters and is 1.8 meters high. Can I come in to view the poles? Yes! Please do come to visit us. We are situated conveniently with easy access of the M13 and N3. Cheryl and Shereen our 2 sales ladies are waiting to take your queries. Yes we do, we have 3 delivery vehicles ranging from a small bakkie to an 8 ton truck so no delivery is too small or too large. Remember! We are enthusiastic about poles and wood and have a vast amount of experience regarding it. We know that experience has been gained over a long amount of time and we are thus happy to share our knowledge and expertise with you. Pick up the phone and give us a call or send us an email, we are ready and available to assist with all of your queries. I would like a jungle gym installed. What is the process? Thank you for investing in your child's happiness and your piece of mind! Your starting point would be to determine your space restraints if any and let us know. Our Jungle gyms come in a modular format and are based around a 1.8m x 1.8m Platform or Structure. You are then able to add on to the structure as you wish from the various array of options that we have. Or Alternatively you are able to select from the our combinations on the jungle gyms page. What makes a Durban Poles Jungle Gym unique? Firstly our platform is larger than most of our competitors which enables more kids to enjoy group play and also makes it more appealing to schools and creches. Secondly we use threadbar, nuts and bolts to join our components together. This ensures strength as well as ease of uninstallation should you require the jungle gym to be moved after a few years. Our poles are of course treated and we also paint the jungle gym with a preservative called wood guard which ensures that it is longer lasting. How long does it take for you to come out and install? This depends on how busy we are but generally not longer than a week. Yes you certainly can, we offer DIY kits with all of the components including threadbar, nuts, bolts and nails as well as most importantly instructions so that you can install yourself. I have a few ideas of my own. Are you able to accommodate? We have built structures around trees, platforms over streams and obstacle courses as well in myriad of different shapes and sizes. The best thing would be to give us a call and we do our best to work on something unique that best fits your needs. We have serious space constraints - do you do a smaller platform? Yes we definitely do. If you are able to tell us the dimensions that we have to work with, we will be able to design a smaller platform to fit into the given space. What is your slide made off? We offer a heavy duty fibreglass custom made slide which is designed for all shapes and sizes of kids. What are my swing seat options? We have three different types of seats. The baby seat - made from plastic and imported from Belgium this seat complies with the highest of European standards ensuring safety for your younger kids. Once installed can my kids get on and enjoy right away? Unfortunately not - we recommend waiting at least 48 hours so that the poles which have been concreted into the ground are able to set effectively. If there are any other questions please do not hesitate to get in touch! We are always happy to chat to our customers!